Russian pianist and composer; born at Staro-Constantinov Feb. 8, 1847; died by his own hand at Lucerne Sept. 15, 1884. He was a pupil of Hellmesberger, Dachs, and Liszt, and a friend and ardent admirer of Wagner, from whose drama "Ring des Nibelungen" he made excellent pianoforte transcriptions. 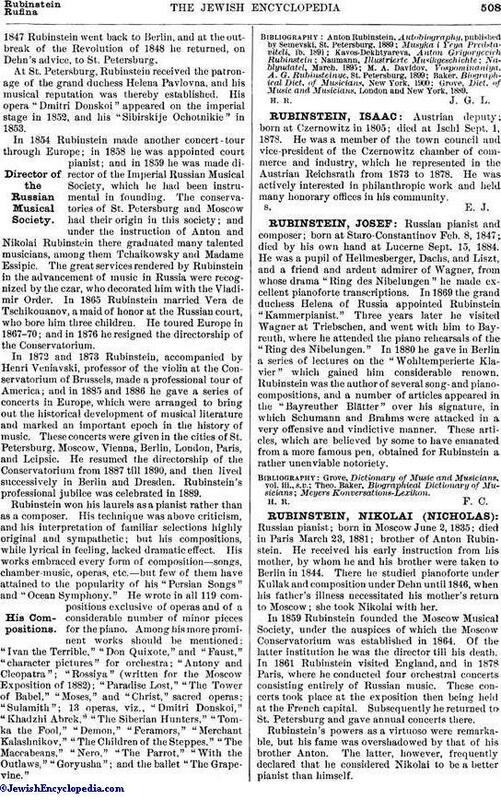 In 1869 the grand duchess Helena of Russia appointed Rubinstein "Kammerpianist." Three years later he visited Wagner at Triebschen, and went with him to Bayreuth, where he attended the piano rehearsals of the "Ring des Nibelungen." In 1880 he gave in Berlin a series of lectures on the "Wohltemperierte Klavier" which gained him considerable renown. Rubinstein was the author of several song-and pianocompositions, and a number of articles appeared in the "Bayreuther Blätter" over his signature, in which Schumann and Brahms were attacked in a very offensive and vindictive manner. These articles, which are believed by some to have emanated from a more famous pen, obtained for Rubinstein a rather unenviable notoriety.